From test arm to test model, I managed to finish all of the Genestealers for the Space Hulk project I have. 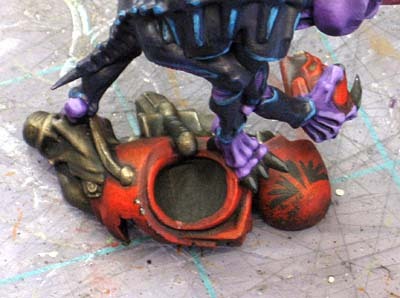 That leaves the Broodlord and the Marines to paint. While there's fewer Marines, they have more detail so I expect them to take a while too. Anyone notice he's only got three arms... where's his fourth? 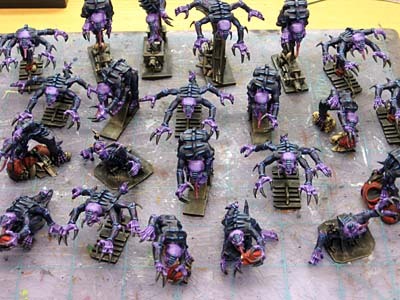 For anyone who hasn't painted their Genestealers yet, make sure you pick a simple and easy color scheme. I matched the box paint scheme and that took me forever. The Marines will be painted like the box too. It makes a difference though. Playing the game with unpainted models vs. playing with painted models makes for a completely different gaming experience. As always Ron, very nice work man. Beautiful work. That colour scheme is a real nostalgia trip, back to the first Space Hulk. Have you thought about mounting them on regular bases? Since they are a uniform colour with only the head hands and feet different it always made me think of them wearing a jumpsuit for some reason. But still very nicely done. 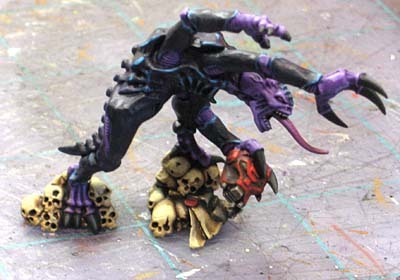 I went a very quick method I picked up from Pit of the Oni - white base, scorched brown carapace and bits, bleached bone claws etc. Then a sepia wash all over. The white goes a tea sort of colour and it automatically darkens the recesses. I got 8 of the critters painted in a couple of hours from sprue to shelf. I painted my old Stealers from the first ed. of Space Hulk the traditional colors too. tentakel: These guys are a commission. They're based for the game and I just tried to match the colors of the base to the board so they blend in as much as possible. Gotthammer: I wish I could have gotten these guys done that quick.